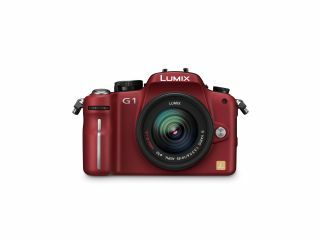 Panasonic broke new ground last month with the announcement of its new DSLR, the Lumix DMC-G1. The camera is the first to incorporate the Panasonic and Olympus Micro Four-Thirds system, which is something of a revolution in photography, as it means the humble DSLR no longer needs to be bulky. And getting our hands on the G1 at yesterday's press launch in Wembley Stadium, we can confirm just how streamlined it is. But we already told you this back in September, with our exclusive hands-on, so we won't go into all the gory details here. What we can confirm, however, is the price of the camera. Panasonic are certainly looking to go aggressive in the DSLR market by pricing the cam at £599.99 with lens. And when can you expect the camera to be on the shelves? The date pencilled in is 1 November. Interestingly, when we had a brief chat with the technical bods behind the camera, they told us that the DMC-G1 could have been much smaller, and that they didn't want to 'scare' people with their first G Micro System camera. This may well mean that we can expect to see much more dramatic changes to the DSLR in the near future.